May-30-2018 | Did You Know Gaming? episode puts the history of UnReal World nicely together in their easily digestable video episode PC Game Constantly Updated For 25 Years. May-21-2018 | Deep interview with cool pictures in Chinese at Chuapp: A game developing for 26 years by Liu Chun. Jan-30-2017 | UnReal World gets Game Swapped in a new Rock, Paper, Shotgun series where one person recommends another a game they might like. Jan-30-2017 | Arvostelu Nörttitytöt sivustolla by Tuuli Hypen. 30-May-2016 | InkTank blog takes a trip down gaming memory lane and posts their list of the 9 most important Finnish video games in history. Yep, UnReal World is listed there. 1-May-2016 | Listen to Roguelike Radio episode on Simulation where Mark Johnson, Darren Grey, Tarn Adams and Sami Maaranen discuss Simulation in Roguelikes. Apr-28-2016 | UnReal World review at PixelPerfectGaming gives 5/5 and states "I continue to be impressed by how fantastic of a game Unreal World continues to be, despite it being the oldest running rogulike survival game on PC." Feb-24-2016 | Game in development for 26 years comes to Steam article at Develop, the only European-based website and magazine totally focused on the games development sector. July-10-2015 | Rock, Paper, Shotgun ranks the 50 best PC RPGs ever released and UnReal World is 26th on the list - "a survival/crafting game that offers a more complete and compelling vision than anything else in the genre." 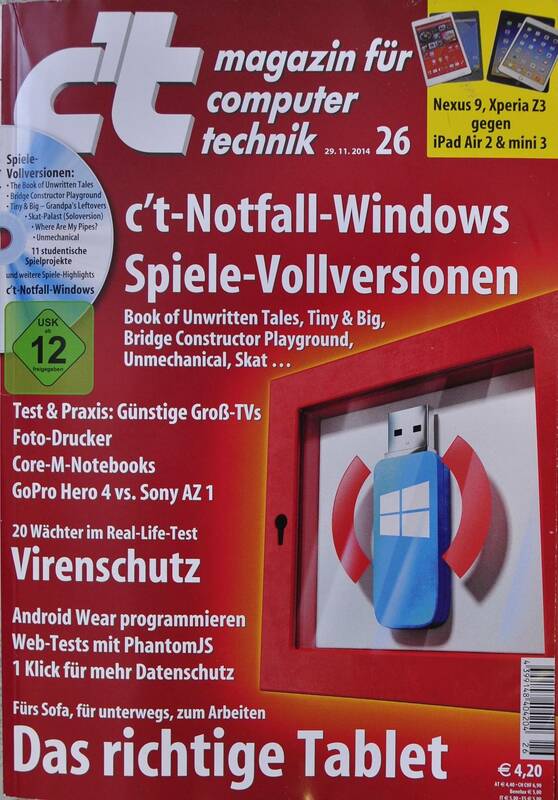 German c't magazine November 2014 issue includes review of Unreal World. Oct-20-2014 | This endless stream of game recommendations at Rock, Paper, Shotgun now asks Have You Played... UnReal World? A finnish book "Sinivalkoinen pelikirja" is the first true chronicle covering the dawn and evolution of finnish video game sector (1984-2014). Here's the page about UnReal World in "Sinivalkoinen pelikirja" where, among other things, it's stated that "UnReal World is Finland's own Ultima". 6-June-2014: Indie Spotlight: UnReal World episode is quite thorough 24 minute video covering the game on Minecraft Lab. "I''ve scrounged up a real corker of a game for you to get your teeth into. ", says Omnigamer and presents to you UnReal World review on Hype Machine. Listen to Roguelike Radio episode about UnReal World. You'll find UnReal World in The Scavenger's Handy Pack Of Survival Games. A History of Finnish Games, Part 2 reaches the times when "another indie game developer, Sami Maaranen, had started working on his bigger-than-life project, UnReal World, in the summer of 1990. [..] But the vastness of the game was something unheard of in a roguelike..." and so on. A Roguelike Primer: Best In Genre For Neophytes & Veterans Alike is a basic guide to the best roguelikes for beginners, experts and those looking for something a little different. You'll find UnReal World there among many others. Listen to Sami talking about indie games on Malevolence podcast episode 11. Electronic Phillistine review states that UnReal World seems rather real. Anti-Skyrim: Iron Age Roguelike UnReal World Goes Free post at Rock,Paper,Shotgun says it all in a nutshell and requests comments: "Let us know you how get on with UnReal World. I want to hear stories of being eaten by bears in the middle of the night, eating your own clothes to survive, that sort of thing.". On Feb-22th-2013 TIG source announces that UnReal World is now free. Nathan finds UrW "a beautiful, fairly well-executed survival/RPG sim, but quite complicated" in his UnReal World review on Independent Gaming blog. Feb-20th-2013, The Indie Game Magazine highlights the fact that UnReal World RPG is going free-to-play later this month. The Escapist: A Game 20 Years In The Making is an excellent article by Stephen Murphy based comprehensive interviews during 2012. Just like real life except fun! article about surviving (on occasion) in the wilderness of digital Finland at Deep Thoughts blog. My Year in Roguelikes article and review of NEO scavenger tease with few lines about features and feeling of UrW on Rock, Paper, Shotgun site by Adam Smith. UnReal World is found interesting on That's interesting... blog article by Bill Garthright. Author's audio interview back in 2004. Sami was interviewed on finnish national radio (YLE1) for a culture broadcast Kultakuume. There's english translation available. Interview is also available transcribed in finnish. The very first UrW newsflash in printed media was published by finnish Pelit-magazine back in 1996. This scanned article talks about descendants of Hack and Rogue - in finnish, of course.